When I was a kid, my parents would pack all the camping gear in our mini-van and we would head to the Great Smoky Mountains. 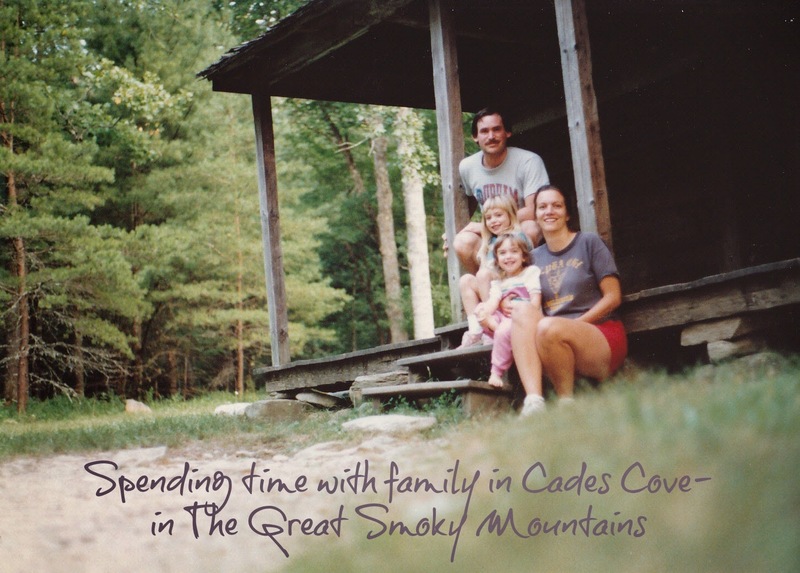 Many of my fondest summer memories are of spending time with my family in Cades Cove, an isolated valley in the Great Smoky Mountains. This past weekend, my parents flipped through family photo albums and came up with these gems! You don't have to be a camper to love the Great Smoky Mountains! Aside from the campgrounds, there are beautiful cabins and other lodging facilities. There are endless locations to explore! It really is a beautiful place to take your family. With that being said, I have very exciting news for you! 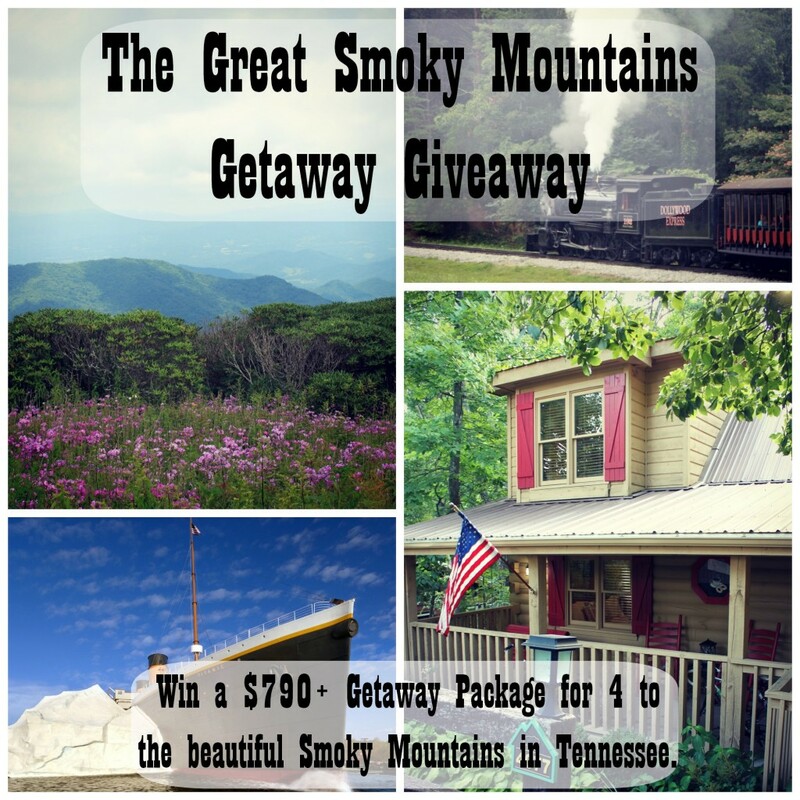 I am co-hosting a giveaway for a Great Smoky Mountains Getaway!! Are you looking to plan a beautiful vacation for your family? 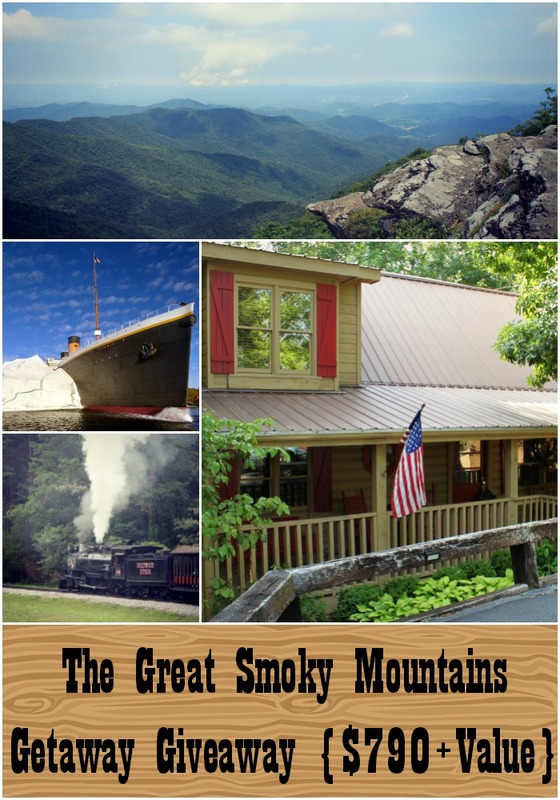 Bare Feet on the Dashboard is partnering with Hidden Mountain Resort, the Titanic Museum of Pigeon Forge and Dollywood to give one lucky reader a luxury getaway to the Smoky Mountains of Tennessee. This family giveaway is valued at over $790- no strings attached! The contest is free and simple to enter. If you are interested and want more details on the giveaway- just keep reading! The Great Smoky Mountains are the perfect place for a getaway. Enjoy the scenic beauty, while visiting America's most popular national park. You will have access to tons of restaurants and attractions in a family friendly atmosphere. *A family pass to the Titanic Museum in Pigeon Forge. Hidden Mountain Resort has a community of luxury cabins and villas for visitors as well as a motor coach resort. The resort is on the side of a mountain with a secluded feel- but still close to all the action! The lakes and walking paths are perfect for a mountain stroll. The accommodations are fitting for any size group. You can read a full review of the cabin rentals at Hidden Mountain here. Dollywood is a family friendly resort located in Pigeon Forge, Tennessee. With world class rides and entertainment, it brings the best of the amusement park and country music worlds together to create a one of kind experience courtesy of the founder, Dolly Parton. Read our full review of Dollywood here. *My grandmother took us there when we were little. They have rides and attractions to keep the whole family entertained! The Titanic Museum in Pigeon Forge is a celebration of the lives of the passengers of the Titanic. The museum offers a hands on experience for visitors- feel what it would have been like to step onto the beautiful ship! 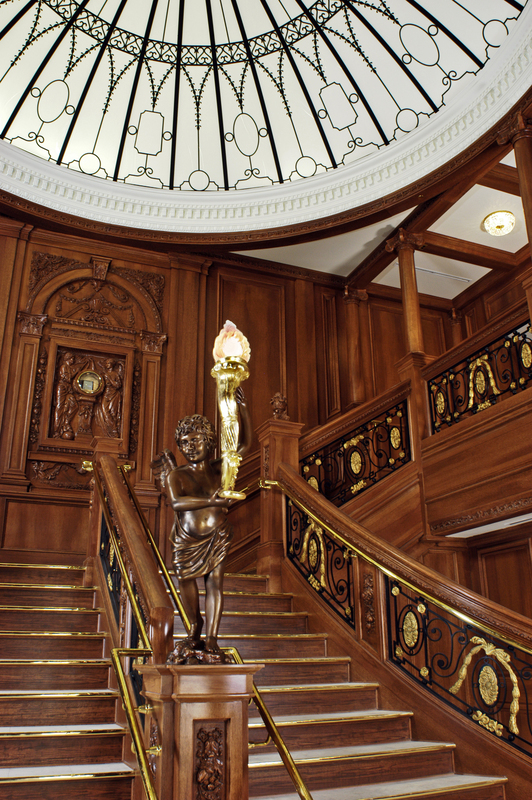 You can walk down the grand staircase while learning about life on board as you walk through the 20 galleries of the museum. The interactive exhibits make this museum a great family friendly stop. Are you ready to win your own Smoky Mountain Getaway? You don't need a blog or Facebook account to enter, just an email address. Simply, use the Rafflecopter form below to enter. Yay for your giveaway being open worldwide.I love the Mountain Breeze cabin. That sounds like an awesome giveaway!!! Wow. I have always wanted to go to Dollywood!! I see they have a lot of different cabins, plus there is a Hidden Mountain East that is a gated community. Group giveaway - fun! I love the idea of visiting the Titanic museum! I would love to stay at one of the cabins. Maybe the Hidden Mountain it look nice! Mountain Breeze! These cabins look amazing! Oh my goodness.. I want to win! This is one of our favorite family getaways because it is so close. We have Dollywood season passes and the boys LOVE it! This looks like a beautiful place! What a wonderful place to stay with family. I love the cabin especially. I would love to stay in the Mountain Treehouse. Beautiful! What an excellent getaway (and giveaway.) I live not far from there - and I have several friends who live in Sevierville. Such a fun place to visit! Oh how awesome! I entered and would love to stay at the Dancing Bear Lodge! I've been to a couple different Titanic exhibits and they are always so amazing. The Tree house Cabin looks AMAZING!! The Smokey Mountains are beautiful. Dollywood is nice, but the real beauty is in the surroundings and the little shops that dot the area. It's just gorgeous. Good luck to all the Entrants!!! I can't wait to see which Jamberry Wrap the Lucky winner chooses as their prize!! Wow, what a generous giveaway. I love that it includes attraction instead of being lodging only. I've never been to TN but this sounds like a great way to enjoy it. The Dancing Bear lodge looks incredible! Lots of people from my area head to TN for vacation but we've yet to go. Thanks for the chance! What an awesome giveaway! I love visiting Pigeon Forge. The Titanic Museum is one of my favorite attractions. Amazing giveaway. Sure to be a fun time! I would love to rent the River Lodge for a family reunion. Wow, what a great giveaway! I would definitely love spending time here! What an awesome giveaway!! Love the pictures too! Looks like great family time too! I think the Titanic museum would be so fun to visit. Actually, the whole getaway sounds amazing. And that is a fabulous giveaway too! The Great Smoky Mountains are so beautiful! I would love to be able to visit again. I haven't been there since I was a child. I'd love to go back. I'd stay in the Lighthouse Point cabin! I have never been there I bet it's a ton of fun and I loved the pictures. I would love to get away with my family to a secluded place like this one. It would be great to have the kids turn off the technology for the duration of our stay. I wish I lived closer, too. I have always wanted to go to TN, but I can't afford the plane tickets to enter this right now. Oh how I would love to win this trip! I would love to stay in that log cabin that have pictured. Beautiful and perfect. Wow - what an amazing getaway! I'd love to visit there! This looks like such a great place to visit! Thanks for sharing your beautiful moments. The pictures with your family is so precious. Especially the one with your sister. Too adorable. :) This looks like an amazing getaway. We are always looking for fun weekend trips. It seems like there is more than enough to keep one occupied for a long weekend! I love little hiking trails like that one pictured above. They are so peaceful. That looks so great. I'd love to go to the Titanic museum! I like the Icy Pink Polka set. My friend takes a trip every year with her family to the Smokies. I'd love to go. Looks beautiful. I think I'd choose Robin Hood's Castle. This looks like a lovely place. Your photos are great! I love the red porch of the Hidden Mountain Resort. It looks like a quiet and tranquil place to go visit. So beautiful I would love to visit the mountains for a weekend. the whispering hope cabin looks cool. How pretty! I'd love to visit the Smoky Mountains someday! What a fun, relaxing vacation it looks like you had! Very nice. I would like them all. 1948 looks great as does Winter Lodge. What a beautiful place! I would love to stay in the Big Elk Lodge! This is a GREAT giveaway! I love the pendants! I think I'd pick the "I Love You To The Moon And Back" one! So sweet! This is a great giveaway! I'd love to take a trip like this when my kids are a little older. I don't enjoy camping but I do love the outdoors so this would be the perfect getaway for me! Looks like my kind of "roughing it"! breathtaking images! I would love to stay at 1948. what a gift it would be to win this giveaway! That looks like an amazing trip. I love the pic of your two girls that is such precious photo. I always adore going to Dollywood, and you guys look like you had a blast! Not to mention that you got some amazing pics! i have been DYING to visit Dollywood! I would love to take this trip. We pass Sevierville everytime we drive to Tennessee and always plan on going to the Smokies. Oh how nice. That looks stunning. I am sure the trip was amazing. That looks so fun! I would love to go on a trip like that. What a great little vacation. The cabins look rustic yet beautiful. The vacation package sounds like a great deals. I would love to explore Smoky mountains too.. Hopefully someday that will happen too. This is absolutely one of my favorite family destinations. We love everything mountains and especially Dollywood. What an awesome giveaway! Thanks for this great chance at a fabulous getaway. This is absolutely one of my favorite family destinations. We love everything mountains and especially Dollywood. What an awesome giveaway! man all these cabins are so nice! it's hard to decide which one i'd chose, but i love the nineteenth hole and the cubs cove. Beautiful pictures! I hope to go to Dollywood one day! And I love the idea of the recreated Titanic, i am sick of hearing about what happened after, lets celebrate its beauty! Very quiet and tranquil. A perfect little getaway! 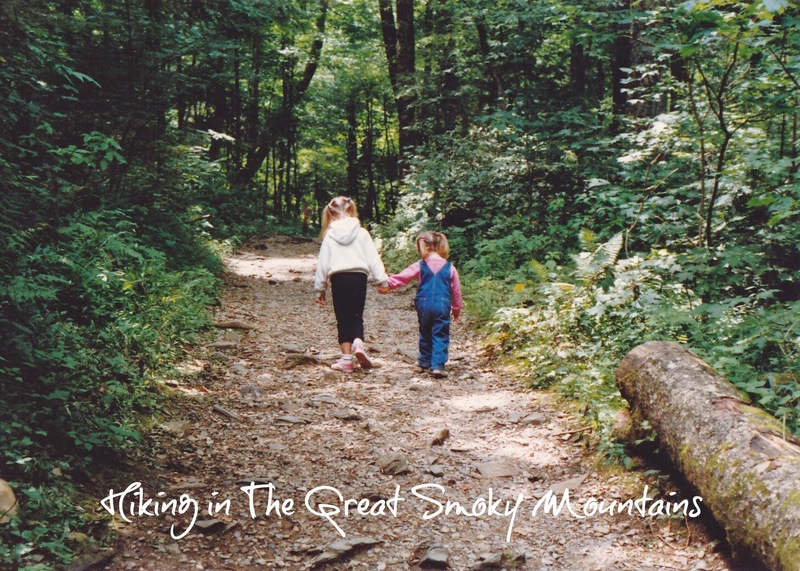 Some of my favorite family vacation memories are in the Great Smoky Mountains of Tennessee! Dollywood is so much fun, too. 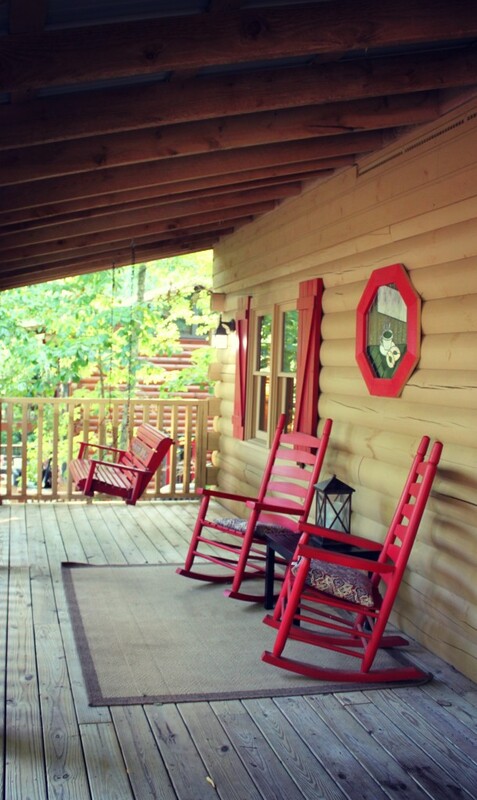 I would love to be sitting on that porch right now relaxing. I bet you could see some wild life if you sat still enough. What a fun vacation! I would love to win a trip to enjoy the Smoky MOuntains. Want to hear something funny? I literally just left the Smoky Mountains and also the Nantahala National Forest this morning! We vacation there every summer because so much of my family still lives in the area! Wow, what a wonderful place to visit! looks so peaceful, just what I need! I love the Smoky Mountains. I used to go their with my parents when I was a kid. There's so much to do and see there, and the scenery is beautiful. I've never been before but would love to go to the Smokey Mountains. It's on our short list of places to take a family vacation. I'd love to stay in the Twin Lodge. What a pretty cabin! Wow looks wonderful! I would live to see the mountains one day!